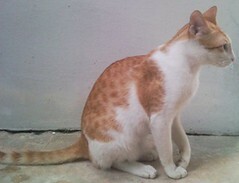 Josh is a young ginger spotted tabby white male cat with lovely amber eyes. He is very affectionate, calm, and loving. 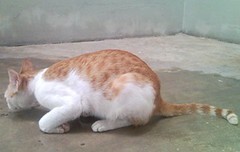 He is not afraid of other cats but is non-aggressive. In fact will try to be friends with the cats he meets. 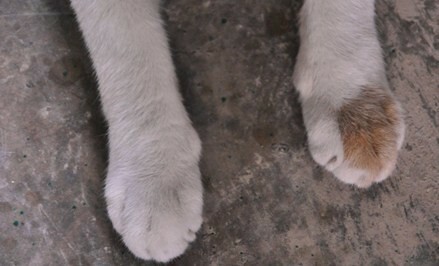 Of all his paws, Josh only has 1 ginger patch on his left front paw. Eagerly waiting for his real forever home, Josh is estimated to be about 1 yrs old. He is sterilised and litter-box trained. Josh was first sighted in Area 1 very late last year, he was probably about 8 months old at the time. Scaredy and scrawny, he would run away when approached and appeared occasionally, when we were not prepared to nab him for mojo-robbing. It was only beginning in February that he allowed contact, but even then he was a bit wary. Finally, on 16 Mar, he came up to us, approaching us voluntarily for the first time. He was limping and his left shoulder/frontleg/paw seemed to be disabled and he could not put any weight on it. He was brought in to the vet, and sterilised on 17 Mar while having his injured leg x-rayed. Thankfully, he merely had an inflamed wound on the shoulder as suspected. It was probably inflicted on him by one of the alphas as he scrounged for food. He was moved to Foster Mum’s after discharging on 18 Mar as he needed to be fed a 2 week course of antibiotics, and we were not confident of meeting him regularly. Josh has recovered fully. 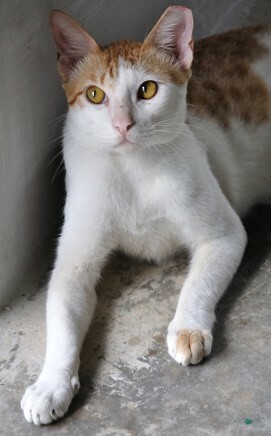 He has also turned out to be a calm, gentle and loving cat who wants to be friends with everybody. So we’ve decided to try to rehome him instead of releasing him back to Area 1 where he may very well sustain similar injuries again. 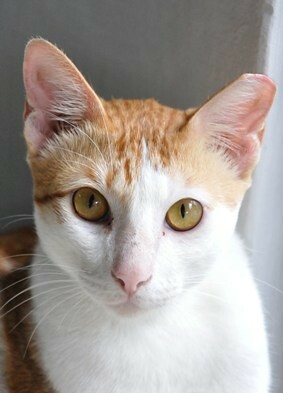 This entry was posted in Abandoned Pets, Animals, Area 1, Cats, Foster Mum, Homeseekers / Adoption, Josh, Mojo Robbery Care Package / TNRM, Singapore, The Clans and tagged adoption, animal rescue, Cats, Singapore. Bookmark the permalink. i live in chiang mai thailand. many cat need home here too.